Art Every Day Month is next month! I hope you're excited! If you're looking for a little extra help through AEDM, check out the Survival Guide! Ways to share: Once you've signed up, you can leave a comment on this post and/or use the "Mr. Linky" widget below to link to a blog post(s) about your creative activities during the days of 10/22/12 - 10/28/12. I am finally back on track, with posting and creating. It has been a challenging few weeks. I is good to be back. Hi Leah! Thanks for hosting this fun and creative party ) Hope you have a lovely week! This might be cheating a tiny bit, as I did this painting recently but not, like, TODAY. But I couldn’t resist as it’s not only a tree painting, but it also uses today’s quote! Looking forward to AEDM; I’m doing it with a friend this year for extra accountability! Trying to get my creative “mo-jo” back on…. Creative Every Day is always such an inspiring place to visit! Thanks for hosting and can’t wait for AEDM!! cant think where to start … ! 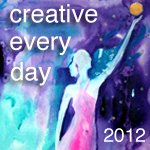 I linked my blog up for the Creative Everyday Challenge. I am looking forward to meeting you and other artist and hoping to get creating ASAP. I first found your Nov. Challenge, but I think I like the year round challenge more and hoping it helps me get more motivated. I feel totally insane for ‘taking on’ anything else, but I’m definitely feeling like I just want a fun, no-pressure way to enjoy creating art everyday, and why not use some awesome group energy to do it! Oh dear. I tried to sign up for November’s Art Every Day Month and think I also accidentally signed up for Creative Every Day. The various links/sign-ups confused me…I’m so sorry. I can’t find a way to delete myself from what I *think* is the wrong sign-up, either. Hey Amy, Don’t worry about it!! Yes, feel free to have your son post his work on your Flickr too! Can’t wait to see!